Parkinson’s Disease – (PD) belongs to a group of conditions called motor system disorders, which are the result of the loss of dopamine-producing brain cells. The four primary symptoms of PD are tremor, or trembling in hands, arms, legs, jaw, and face; rigidity, or stiffness of the limbs and trunk; bradykinesia, or slowness of movement; and postural instability, or impaired balance and coordination. As these symptoms become more pronounced, patients may have difficulty walking, talking, or completing other simple tasks. PD usually affects people over the age of 50. 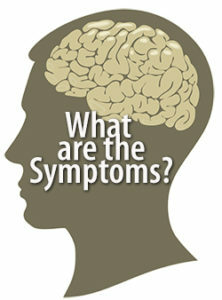 Early symptoms of PD are subtle and occur gradually. In some people the disease progresses more quickly than in others. As the disease progresses, the shaking, or tremor, which affects the majority of PD patients may begin to interfere with daily activities. Other symptoms may include depression and other emotional changes; difficulty in swallowing, chewing, and speaking; urinary problems or constipation; skin problems; and sleep disruptions. There are currently no blood or laboratory tests that have been proven to help in diagnosing sporadic PD. Parkinson’s disease is caused by the progressive impairment or deterioration of neurons (nerve cells) in an area of the brain known as the substantia nigra. When functioning normally, these neurons produce a vital brain chemical known as dopamine. Dopamine serves as a chemical messenger allowing communication between the substantia nigra and another area of the brain called the corpus striatum. This communication coordinates smooth and balanced muscle movement. 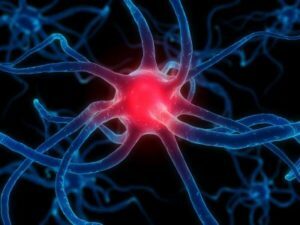 A lack of dopamine results in abnormal nerve functioning, causing a loss in the ability to control body movements. Ø Tremor. A tremor, or shaking, usually begins in a limb, often your hand or fingers. You may notice a back-and-forth rubbing of your thumb and forefinger, known as a pill-rolling tremor. One characteristic of Parkinson’s disease is a tremor of your hand when it is relaxed (at rest). Ø Slowed movement (bradykinesia). Over time, Parkinson’s disease may reduce your ability to move and slow your movement, making simple tasks difficult and time-consuming. Your steps may become shorter when you walk, or you may find it difficult to get out of a chair. Also, you may drag your feet as you try to walk, making it difficult to move. Ø Rigid muscles. Muscle stiffness may occur in any part of your body. The stiff muscles can limit your range of motion and cause you pain. Ø Impaired posture and balance. Your posture may become stooped, or you may have balance problems as a result of Parkinson’s disease. Ø Loss of automatic movements. 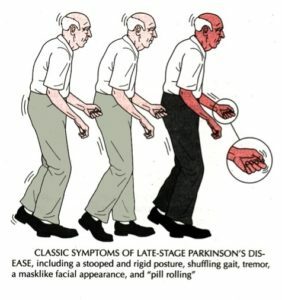 In Parkinson’s disease, you may have a decreased ability to perform unconscious movements, including blinking, smiling or swinging your arms when you walk. Ø Speech changes. You may have speech problems as a result of Parkinson’s disease. You may speak softly, quickly, slur or hesitate before talking. Your speech may be more of a monotone rather than with the usual inflections. Ø Writing changes. It may become hard to write, and your writing may appear small. To date, there is no known prevention or cure for Parkinson’s disease. 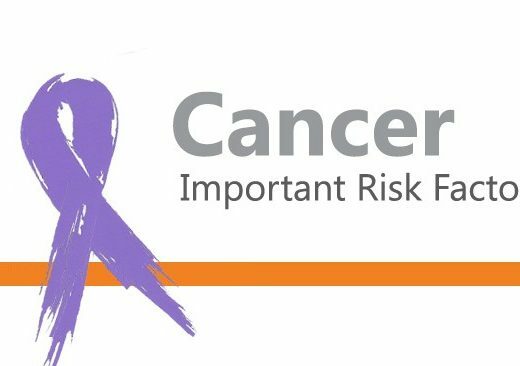 But, there are several treatment options, including drug therapy and/or surgery that can reduce the symptoms, and make living with the disease easier.